Classicism, since the Renaissance, had been the foundation of an expression of all that was superior and exhaled in the fine arts. Capable of morphing, the classicism of the Renaissance, of Raphael and Michelangelo, became the Mannerist distortions of Pontormo and the drama of the Baroque and even the eroticism of the Rococo. By the eighteenth century, “classicism” had become so overridden by the new styles and the new demands of the new patrons that its distinguishing characteristics were nearly invisible. 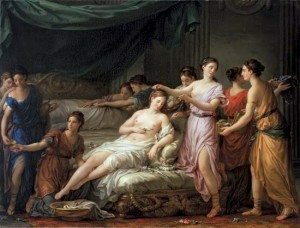 The idiosyncrasies of Mannerism and the drama of the Baroque were alien to the internal calm and self-sufficiency of the classism of ancient Greece and Rome. During the Renaissance, classical sculptures were unearthed and provided the basis for a fifteenth century reinterpretation of the antique. But no authentic example of painting, beyond vases, was available, allowing the classicism of the Renaissance and the Baroque to flourish iwht invention but without discipline. What made Classicism “new” again in the late eighteenth century was a discovery of a new authentic source of Classical painting at Pompeii and Herculaneum, two resort towns near Naples and far too near to the looming volcano, Vesuvius. Buried since 79, these towns were the ancient equivalents of the Hamptons on Long Island, and the wealthy inhabitants had commissioned wall paintings to provide decorations for the unbroken expanses of walls, illustrating ancient and fanciful myths and events of everyday life in antiquity. The significance of the uncovering of the ancient murals is that, after centuries of basing “classical” on sculptures, now there were, amazingly, actual paintings (almost certainly provincial) for contemporary artists to study. These ruins inspired the beginnings of archaeology, however primitive, that fit in well with the practice of scientific analysis and the new respect for empirical knowledge. 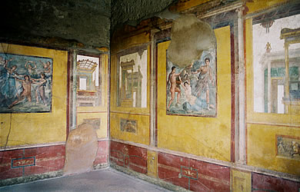 Throughout the eighteenth century Pompeii (discovered in sixteenth century and excavated in 1748) and Herculaneum (discovered in 1701 and excavated in 1738) were being excavated, a process that continues to this day. The 1770s in France were notable for the re-emergence of costume books hat conveyed a specialist antiquarian knowledge of dress. Michel-François Dandré-Bandon spent the years 1726-31 studying in Rome..A vivid draughtsman and theoretician, he wrote and illustrated a number of books, including his magnum opus, Costumes des ancient peuples. Published in six volumes in 1772-74, he dedicated it to the marquis de Marigny in recognition of his encouragement of le goût grec. André Lens’s book, Le Costume des peoples de l’antiquité appeared in 1776. These simple new fashions for the aristocrats, especially the women, who obligingly clad themselves à la grec were well suited to be both a statement of that which was “natural” and politically wise, given the rising political criticism of insensitive displays of wealth. Scholars and tourists inspected the ruins, and artists, such as Hubert Robert (1733-1808) and Canaletto, responded to the demand for Italian vistas with view paintings. For his part Canaletto (1697-1768) provided veduta paintings of Venice to tours who had reached their Italian destination, but Robert satisfied the desire to contemplate the past. The crumbling and romantic ruins of Robert (“Robert des Ruines”) were a painted mix of modern fantasies of the meaning of the ancient world and past grandeur and accurate descriptions of actual remaining buildings. Antiquity, from the reading of Homer to the use of the ancient as a suitable subject for artists, became the order of the day from the mid-eighteenth century on. The only way for us to become great, and, if indeed it is possible, inimitable, is through the imitation of the ancients, and what someone said of Homer, that the man who has learned to understand him well learns to admire him, is also true of the works of art by the ancients, especially of the Greeks. Two years later, an Englishman, Sir William Hamilton (1730-1803), envoy extraordinary to the court of Naples, published a four-folio volume of antiquities as a result of his participation in excavations (and unabashed looting). Hamilton’s post as ambassador did not pay well and he created a side line as an art dealer, excavating Greek vases from ancient sites of colonial settlements in Italy, inflating their value, and selling them to the British Museum. One group of vases arrived safely to England but the another batch of antiquities sank with the HMS Colossus in 1787. Hamilton’s discoveries, including the famous Roman cameo vase, the Barberini Vase, sold to the Duchess of Portland, provided additional information about the drawing style of ancient potters. The luxury folio which presented exquisite illustrations of the vases was titled Collection of Etruscan, Greek and Roman Antiquities (1766-1776). Although the text was in English, the line drawings, strict and plain, created a series of illustrations that were influential internationally and studied by potter Josiah Wedgwood, artists John Flaxmann, Henry Fuseli, Jacques-Louis David, and Jean-August Dominique Ingres for inspiration and information. Continuing his efforts to revive interest in ancient art, Hamilton published another set of folios, Collection of Etruscan, Greek and Roman Antiquities from the Cabinet of The Honble. W. Hamilton, illustrated by Johann Heinrich Tischbein, director of the Naples art academy, in 1791-95. The folio drawing were flat outlines that deftly handled details without becoming orange or cluttered, giving the illustrations a restrained and severe appearance. This burgeoning historicism allowed identification with an ancient past that could be understood in relation to contemporary political goals. To Europeans, Rome was far more accessible as the source of ancient art than Greece. Greece, dominated by the Ottoman Empire, was cordoned off, making it difficult to travel to the territory of Plato and and the Parthenon. Actual (ancient) modern Greece was virtually unknown to most Europeans. 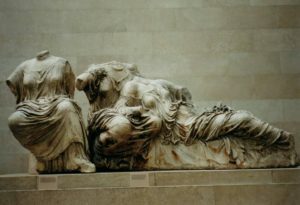 But in a remarkable act of cultural imperialism, an ambassador to the Ottoman Empire, a native of Scotland, Thomas Bruce, the 7th Lord Elgin, convinced the Sultan in charge of the Parthenon, an ancient temple of incomparable beauty and perfection, to allow him to take all the sculptures, external and internal to England. On the surface this stripping was nothing less than an act of vandalism, but there was a counter argument. The Athenians were using the stones of the Parthenon to build their own houses and the building was being slowly dismantled. But Elgin was not interested in saving the building; he wanted the sculptures, because the French wanted the sculptures. Due to the shifting alliances during the Napoléonic wars, the French were shut out of Greece long enough for Lord Elgin to spring into action and was granted permission through a series of firmans or letters of instruction to acquire the art of the Parthenon. 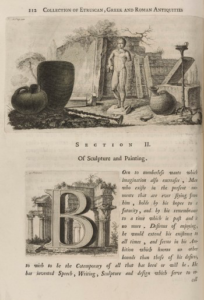 But as Pettijohn noted, the surprising sculptures had an eloquent and very early defender in Georg Hegel in his series of lectures on Aesthetics, beginning in 1818. By the 1820s, he had taken up the issue of the Elgin marbles and their place in antiquity, breaking away from Winckelmann who had seen only Roman copies of Greek sculptures. “The whole body, except the head, witnesses to the truest treatment and imitation of nature. Even the accidental feature of the skin are imitated and carried out excellently with a marvelous handling o f the marble; the muscles are strongly emphasized, the bone structure of the body is indicted, the shapes are constrained, by the severity of the design, yet reproduced by such knowledge of the human organism that the figures almost deceive is into thinking that they are alive, why! even that we are almost scared by them and shrink from touching them..” Hegel wrote, “..even the minutest detail has its purpose..and yet it remains in continual flux, counts and lives only in the whole. The result is that the whole can be recognized in fragments, and such a separatated part affords the contemplation and enjoyment of an unbroken whole.” As Pettijohn explained, “Ingeniously, Hegel has managed to produce a theoretical justification for appreciating the Elgin Marbles in their fragmentary and fractured condition, perhaps the greatest sticking-point to their reception.” In retrospect, it is interesting that Neo-Classicism, as a style, would be identified as “French,” not English, despite the absence of authentic examples in Paris, largely due to the work of Jacques Louis David, a painter.